Covington’s Samantha Whiteman drives to the basket against Danielle Kunk. Versailles’ Lindsey Winner gets off a shot under that hoop against Covington’s Lauren Christian. Covington’s Morgan Kimmel shoots against Versailles’ Liz Ording. 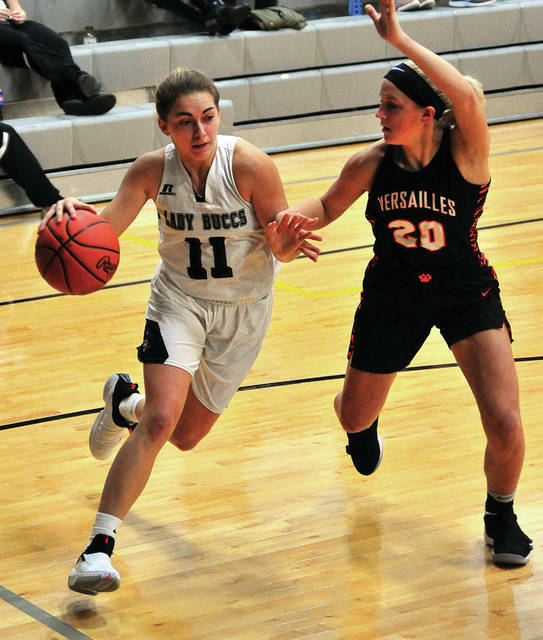 COVINGTON — The scoreboard may have showed a 68-35 Versailles girls basketball victory over Covington Saturday afternoon. But, both coaches felt like it was a victory. Versailles is now 4-0, while Covington drops to 3-1. And Covington coach Jim Meyer thought his team handled things about as well as they could have. And it is not hard to point out the turning point. After an early 3-pointer by McEldowney gave Versailles a 9-2 lead, Covington battled back to take the lead 17-16 with 5:10 remaining in the half behind senior guard Sammi Whiteman. 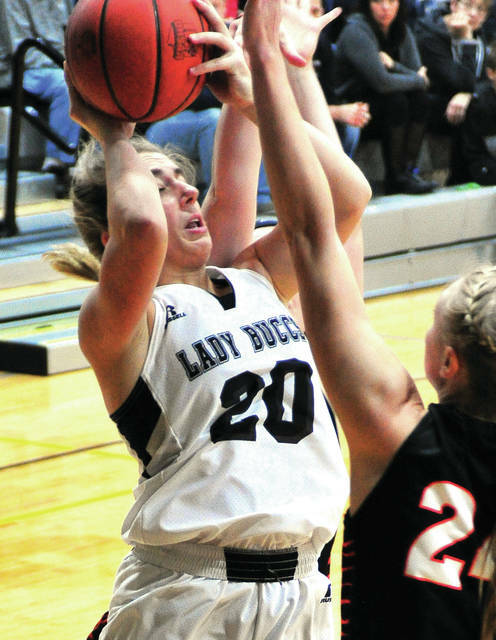 Whiteman had 13 of Covington’s 17 points and Stonebraker decided she had seen enough. The result was the Tigers were able to force three quick turnovers and go on a 19-0 run, before Makenzee Maschino’s basket just before half got Covington within 35-19 at the break. Liz Watren started the run with a three, followed by a Liz Ording 3-point play. Watren and Lindsey Winner scored off steals and Ording scored off another Bucc turnover to make it 28-17 and force a Covington timeout with 3:35 to go. Caitlyn Luthman added four points after that and Winner scored three, before Maschino finally stopped the run with 17 seconds remaining in the half. Versailles increased the lead to 56-27 after three quarters and maintained it in the final eight minutes. Ording had 18 points and seven rebounds to pace the Tigers, while Winner added 13 points and seven rebounds. 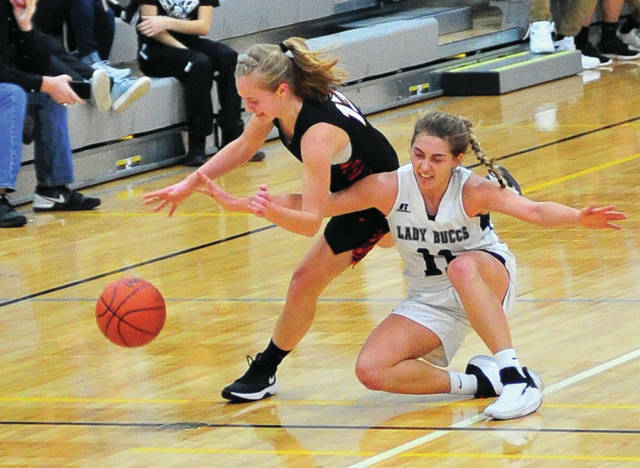 Hannah Barga scored nine points, McEldowney netted seven and Brooke Stonebraker grabbed five rebounds. Whiteman led all scorers with 24 points and was the only Covington player to make more than one field goal and score more than three points. Maschino and Lilly Hamilton each grabbed six rebounds. Versailles 23 of 43 from the floor for 54 percent and 18 of 29 from the line for 62 percent. Covington was 15 of 50 from the floor for 30 percent and five of 11 from the line for 45 percent. Versailles won the battle of the boards 38-26 and had 17 turnovers to Covington’s 16. Versailles will play at Fort Recovery Thursday in MAC action, while Covington will host Twin Valley South Monday. After both coaches left the gym happy Saturday. Caitlin McEldowney 3-0-7, Danielle Kunk 1-0-2, Liz Ording 5-8-18, Lindsey Winner 6-1-13, Kelsey Custenborder 1-0-3, Brooke Stonebraker 1-1-3, Liz Watren 2-0-5, Hannah Barga 2-4-9, Savannah Toner 0-0-0, Caitlyn Luthman 2-1-5, Rachel Lyons 0-3-3. Totals: 23-18-68. Morgan Lowe 0-0-0, Sammi Whiteman 10-4-24, Morgan Kimmel 1-0-2, Claudia Harrington 1-0-2, Lauren Christian 1-0-2, Makenzee Maschino 1-1-3, Lilly Hamilton 1-0-2, Brenna Miller 0-0-0, Leah Poling 0-0-0. Totals: 15-5-35. 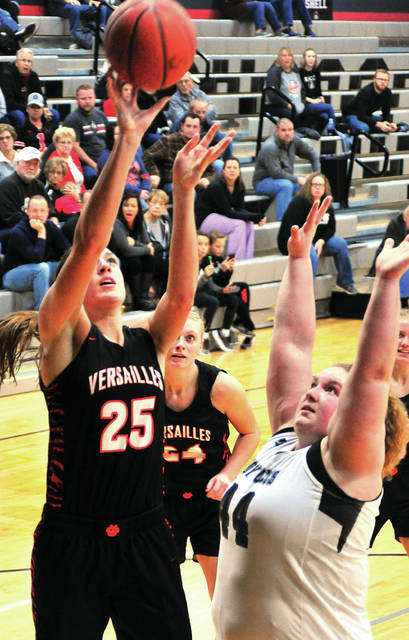 3-point field goals — Versailles: McEldowney, Custenborder, Watren, Barga. Records: Versailles 4-0, Covington 3-1. Reserve score: Versailles 48, Covington 11.